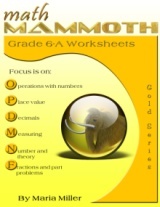 Math Mammoth Grade 6 Worksheets - download two reproducible math workbooks for 6th grade. Math Mammoth Grade 6 worksheet collection comprises two workbooks, 6-A and 6-B, covering all 6th grade topics. The worksheets have been created especially for teachers: each sheet is one page, concentrating on one topic. These are not 'run-of-the-mill' math worksheets. Each sheet in these two workbooks has been "hand-crafted", with varying problems that both emphasize understanding of concepts and practice computation, with variable word problems. In essence, the problems in the worksheets are like what you would find in a regular math book, and far from the mechanical worksheets created by a script. In the first book, 6-A, the four operations are reviewed briefly. There is more emphasis on the properties of the operations and the distributive property. Then, there are worksheets for exponents, square roots, and scientific notation. Decimal place value is covered to the millionths, or 6 decimal digits. Then the worksheets cover all decimal arithmetic. Introduction to percent is based on converting a decimal to percent. Next students find percentages mentally. There are more problems about percent in the sections about fractions and ratios. Estimating measurements is a skill that you can only master by practicing in real-life, and several worksheets are set up for that. The focus is on learning the prefixes of the metric system units, and conversions within the metric system. Converting between customary and metric systems and converting between area units are introductory topics only. Sixth grade students get a good look at divisibility and factoring. LCM and GCF are explained in preparation for fraction topics, which promptly follow. Students study all four operations iwth fractions, with increasing complexity as compared to the previous year. More time is spent on multiplication and division of fractions. When adding and subtracting fractions, the problems include the usage of the LCM and GCF, and bigger denominators are used. There are worksheets about connections with percent and word problems with fractional parts, which are more complicated than in earlier grades. 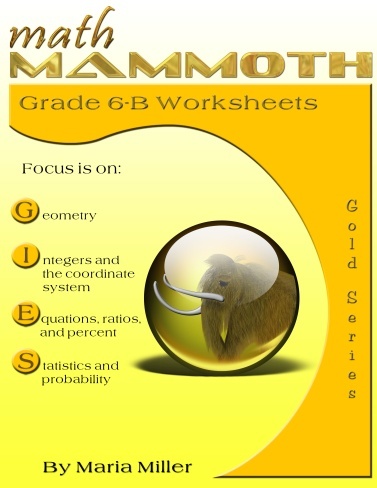 The second book, 6-B, starts with geometry worksheets, which concentrate on angle relationships, drawing triangles, basic compass & ruler constructions, and area. There is an introduction to integers, which deals with comparing integers, adding integers with the same sign or different signs, and some easy subtractions that illustrate temperature changes or number line jumps. Subtracting negative integers is not included. Multiplying integers is used in the context of enlarging figures in the coordinate grid. Gearing up for 7th grade, word problems with ratios and parts are getting more complex. Solving proportions with cross-multiplication is dealt with in passing only. Percent problems are basic and easy, focusing on finding a percentage of a number. Probability problems are still very simple. In statistics, the focus is on drawing and reading different kinds of graphs. This collection of worksheets follows Virginia state standards for mathematics as they were found in 2006. 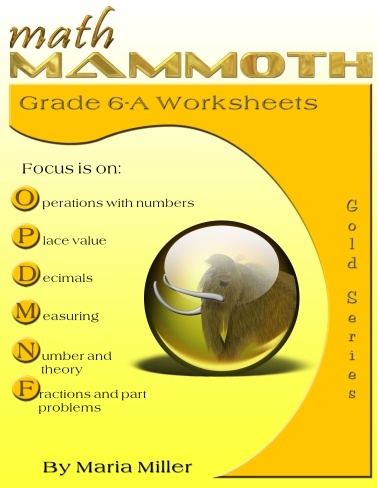 On my other website, you can generate additional, free 6th grade math worksheets to supplement this book.